This publication provides the results of a lengthy study into available mortality and cancer registration data to determine whether any part of the mortality and morbidity experience of the cohort might be related to occupational exposures. 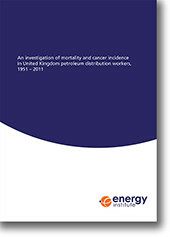 This third edition details an analysis of the mortality and cancer morbidity experienced by a cohort of 16 467 petroleum distribution workers for the period 1951-2011. Its sister publication An investigation of mortality and cancer incidence in United Kingdom oil refinery workers 1951-2011 details the mortality and cancer morbidity experienced by a cohort of oil refinery workers for the same period. The publication presents the materials and research methods used, outlines the results in a clear and useful fashion and includes a detailed discussion of the findings. It is essential reading for all those concerned with the health and safety of petroleum distribution workers in the UK.